A couple of weeks back, we had been to wholefoods market and surprisingly found big, fresh sardines sitting on the seafood aile. We don't get fresh sardines often, so i got a couple pounds and stacked my freezer. I marinated the fish with indian spices and roasted it. 1. Cut the head with a sharp knife. 3. Remove the fins on the sides. 4. Hold the sardines under the running cold water and rinse well. 1. Mix all the ingredients in to a fine paste. 2. Apply the paste on the fish and gently massage to coat the fish. 3. Let it sit for atleast 1/2 hour. 4. Heat a heavy bottomed pan (i used a normal non-stick pan), Coat the pan with cooking spray. 5. Place the fish on the pan and leave it for 3-4 minutes on each sides. 6. If you want the fish to be more crispier leave it another 2 minutes on a low flame. 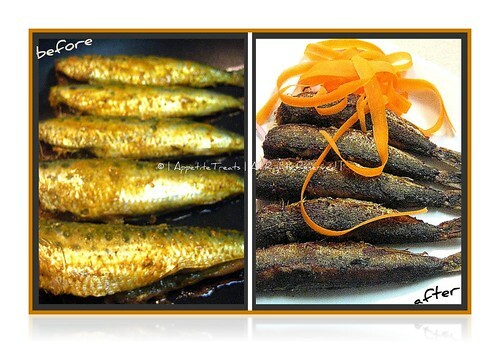 Roasted sardines...one my fav fish.....I'm drooling here.....Nice click and presentation! so crispy...so crusty...i can almost feel the intense aroma and the perfect piece on the platter!!! 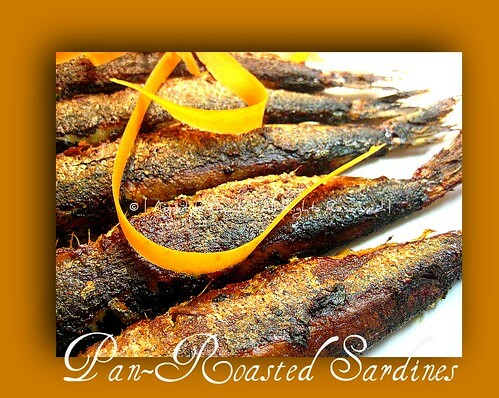 hmm..perfect and spicy..yes,the aroma reaches here too,cant resist..
Woww such a crispy pan roasted sardines, looks fantastic..
Looks delicious .. nice click..
You way of representing the recipe is good. wow, they are so appetizing, nice crispy they look; reminds me of an old tamil movie ( sivaji and raadha) eating nethili meen ; if you don't know, just forget it!! hehe, they look just perfect !! !